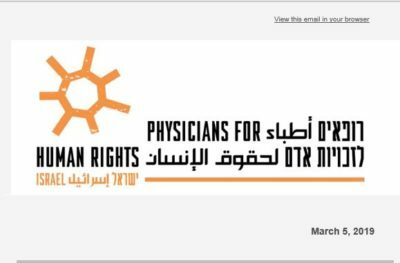 Report By Physicians For Human Rights – Israel: Ahead of International Women’s Day, Physicians for Human Rights Israel (PHRI) is releasing its report “Between the Hammer and the Anvil: Women’s Right to Health in Gaza”, on the way in which Israel’s medical exit permit policies impact women. Although UN Resolution 1325 on women, peace and security, taken together with other follow-up resolutions such as UN Resolution 1889, oblige Israel to adopt a gender perspective and identify the unique needs of women in conflict, there has been no attempt to take into account or minimize the harm done to women. 1) Female cancer patients are facing severe restrictions. In the last two years, 129 women from Gaza reached out to PHRI after their medical exit permits were denied or significantly delayed. This lengthy wait for permit responses and delays in treatment reduce the likelihood of recovery. 2) Medical exit permit denials based on the justification that patients have “family proximity” to Hamas disproportionately impact women. Women needing medical treatment were denied twice as often as men as a result of this criterion. From 2017-2018, 969 patients were denied on the basis of this criterion, of which 608 were women. 3) Women are impacted by the conditioning of medical permits on their ability to return relatives living “illegally” in the West Bank back to Gaza. This justification, which increased in use in 2018, includes the claim that if these patients receive exit permits for medical treatment, they would move their residence to the West Bank. Roughly 50% of permit denials based on this criterion impact women. Most of the relatives who moved to the West Bank from Gaza are men, and as a result this policy punishes women for the actions of men. Address Resolution 1325 and other relevant resolutions and build an action plan for their implementation. Ensure that all female patients in need of medical care be allowed to leave Gaza to access the best medical treatment available to them, without delay.